Do you love succulents and cats? Are you wondering whether it is safe to have them both in your house? You are definitely not the only one. 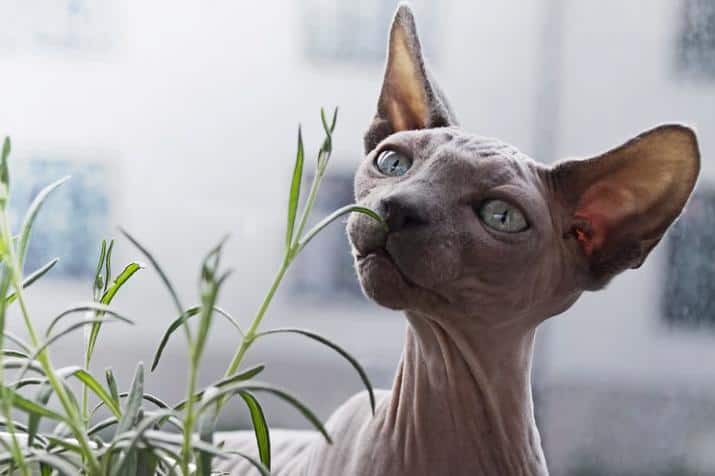 This question comes up a lot and although I’ve addressed this question in my post “9 Succulent Plants Toxic to Cats, Dogs or Pets”, I feel there is still a lot of unanswered questions people have about succulents and cats so this post will address those concerns further. Firstly, before we answer anything else, are succulents poisonous to cats? We say when in doubt, look it up. 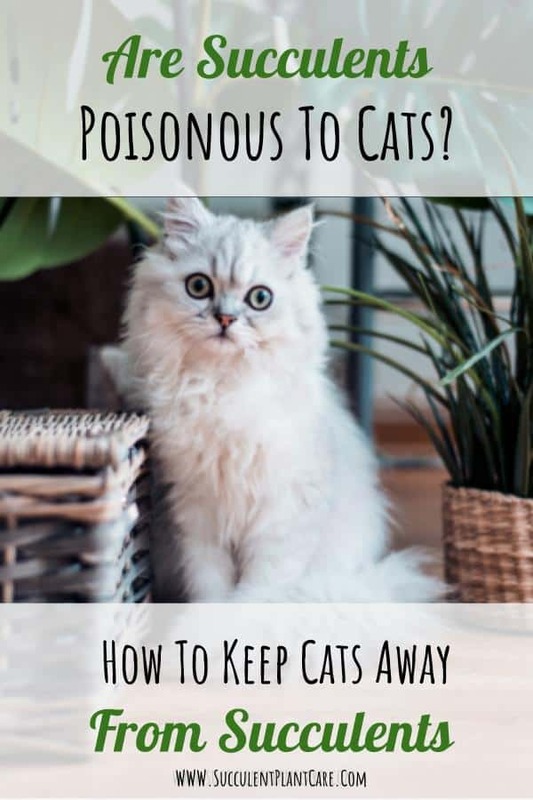 However, it is not always easy to find information about a specific succulent plant’s toxicity to cats or pets because there may not be sufficient data available. The plant may be a new hybridized species and there just isn’t enough information available. You may also find conflicting information on a particular succulent’s toxicity to cats. Some source may say it’s safe while some may list it as poisonous. Take a look at where the source came from to determine how reliable it is. I like to go with sources that deal with pets directly like the ASPCA or Pet Poison Helpline. If you looked it up and still can’t find conclusive information about a particular plant’s toxicity, it is best to proceed with caution. Thankfully there are numerous succulent plants you can choose from that are safe to have around your cats. In fact, I have compiled a list of succulents that are safe for cats here: “Top 17 Succulents Safe For Cats, Dogs and Pets”. Saying that cats are unpredictable may be an understatement. Each cat has his/her own unique personality. 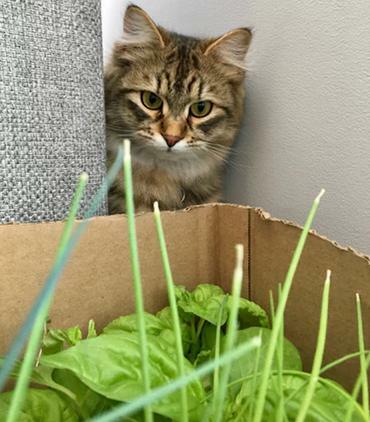 Some cats may completely ignore your plants while other cats may find your plants interesting and irresistible. 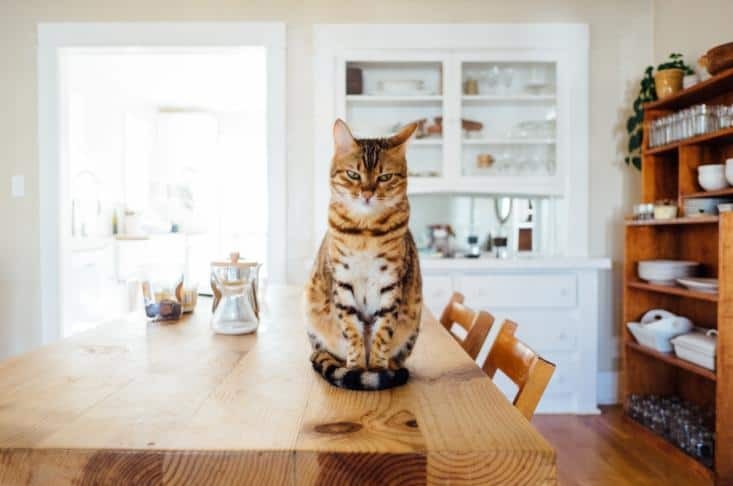 For the most part, cats and pets do not find succulents particularly yummy so they generally stay away from them after one or two bites. BUT there are always those pets that deviate from the norm and these are the ones you’ll find taking a nibble here and there or even feast on your succulent plants. You know your pet’s personality the best so you would know whether you have a plant chewer or not. If you just recently got your pet, you will know soon enough whether you have a plant eater (wrecker) or not. Also referred to as Bryophyllum Delagoensis, these are very easy to grow. Too easy that they are considered invasive in some parts. These are not only poisonous to cats but also to other pets. They can be fatal when consumed in large quantities. 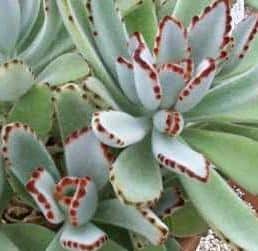 Click here to learn more about this plant “Kalanchoe Delagoensis ‘Chandelier Plant’ Care and Toxicity”. Symptoms include gastrointestinal irritation, upset stomach, vomiting, diarrhea, abnormal heart rhythm. These are very popular houseplant that can be grown both indoors and outdoors. Depending on where you are, you can easily find these plants anywhere these days. 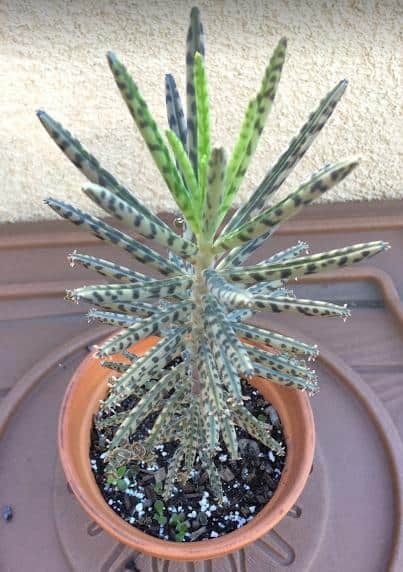 All parts of Kalanchoe Tomentosa are toxic when ingested and can be fatal to cats and dogs in large amounts. Symptoms include vomiting, diarrhea, lethargy. Watch your pet for unusual behavior such as excessive drooling, vomiting, diarrhea and breathing problems. Have your local veterinary helpline number or emergency poison control number readily accessible at all times. Contact your local veterinarian or poison control center immediately if you suspect poisoning. Not the cat– but your succulents. Get one of those wired cages and keep your plants in there. Cats, dogs, pets and even toddlers won’t be able to access the plants so they will be protected from curious hands and paws. I like these wired cages because they allow the sun and fresh air in so your succulents will still be getting enough sunlight and proper air circulation while being protected. Don’t like how these wired cages look? How about birdcages? I see them everywhere these days especially on Pinterest. People make amazing succulent arrangements in one of these bird cages. You do not have to plant your succulents in them but you can place the whole potted plant in the birdcage. That way they are protected from your pets in a chic, elegant fashion. Here are some of my recommendations for cages and birdcages. Cats are naturally very curious creatures and they love to explore. It is for their best interest to provide them with plenty of toys and entertainment not just to keep them away from your succulents, but for their overall wellness. A bored cat will find your succulents more appealing than an occupied one. Provide a scratch post. 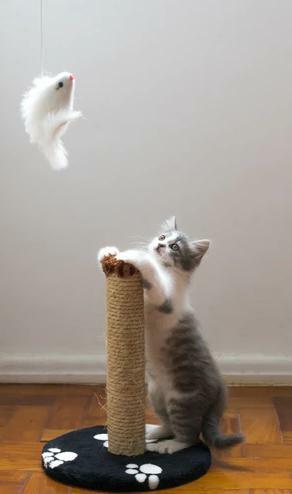 If you do not have one yet, a scratching post for your cat is a must. Any rough surface that the cat can use to scratch and sharpen his/her claws will do. Cats need a scratch post to let out their natural impulses to scratch and claw things. This will save you a lot of headache and will save your furniture/carpet/plants from a lot of damage. Offer lots of toys and trinkets. Cats love things that move so hanging toys are great. Have a variety of toys and spread them around the house. The goal is to keep them engaged and entertained so they will leave your plants alone. If at all possible, keep your plants in one room where the cat cannot access them or designate an area in the house just for your plants. Preferably the room or area should have plenty of sunlight pouring in to keep your succulents happy. There are plenty of safe plants that cats love. The idea is that if you have plants that cats love around, they’ll leave your succulents alone. Sometimes it works, sometimes it doesn’t. Like we say, cats are unpredictable but it’s worth a try. Either way, you’ll provide some distraction for your cats. Cat Grass–These are really easy to grow indoors and very safe around cats, other pets and humans. Most cats love cat grass and will happily nibble and play around it for hours. Catnip (Nepeta cataria) –Can be grown indoors or out. Most cats are drawn to catnip. It naturally stimulates cats providing them with a burst of energy, followed by a mellowing effect. Catnip can be bought as a plant, or grown from seeds. They are also available in powder form and sprinkled on all sorts of surfaces. A word of caution about catnip: although safe for cats, too much can cause overstimulation in some cats. For some reason, ASPCA lists catnip as toxic to cats. If this is your first time trying catnip for your cat, monitor your cat’s activity around it and take note of any unusual activity or harmful effect it may have on your cat. Catmint (Nepeta mussinii) –Aside from catnip, cats also love catmint. These can be grown indoors or outdoors. They appear more ornamental than catnip and produce pretty lavender blooms. Boston Fern–Easy to find and can be grown indoors. Makes an attractive looking houseplant that is safe for cats. Looks great in hanging baskets. Rosemary–Cats seem to hate the smell of rosemary and will stay away from them. Citrus–Strong citrus scents deter most cats away. Lavender–Another herb cats do not like because of the smell is lavender. Rue–An herb with a strong scent that cats do not like. Scaredy-cat plant (Coleus canina)–may be planted outdoors to keep cats away from your outdoor succulents but the smell can be unbearable even to humans. Plus, some cats are just not deterred by it. Is there such a thing as a cat repellent spray to keep cats away? Yes, apparently there is. There are natural ways to do so without harming your succulents or your cat. You may even find most of the ingredients you need in your kitchen cabinet. Here’s a quick and easy recipe: Get a spray bottle, fill it with water and sprinkle it with a little cayenne pepper. Spray this on the plants. Cats do not like the taste of cayenne pepper and will stay away. Combine black pepper, dry mustard and cinnamon (about 1 teaspoon altogether) in a spray bottle. Put a few drops of citrus essential oil. Throw in one crushed garlic clove. Spray on your plants to keep cats away. If you do not want to make your own spray and prefer purchasing one, you can try these commercial sprays: Bitter Apple Spray or Bitter Lemon Spray for cats and dogs. These sprays are marketed for dog and cat owners to keep their pets away from things. These sprays are non toxic and will not harm your pets or your plants. Before you spend money on these sprays, keep in mind that cats and pets have a mind of their own. Some will be deterred by these sprays, while some may find them even more enticing. Get some sticks or skewers (those wooden chopsticks from a take-out place will also do). Stick these sticks in the soil and place them all over the planter. These can help prevent your cats from digging in the soil and damaging or eating your plants. Aside from sticks you can also use rocks with sharp edges and place them on the soil. These can help prevent your cats from digging in the soil and keep them away from your plants. Which do you love more, your cat or your succulents? Just kidding!–You don’t have to choose. I know it can be a challenge to have pets and plants in the house together. Usually we have to choose between one or the other but with a little bit of planning and resourcefulness you can have them both coexisting happily. If you suspect poisoning, contact your local veterinarian immediately or the ASPCA Animal Poison Control Center at 888-426–4435. Wondering where to buy succulents online? Visit my resource page for recommendations on where to purchase succulents online.